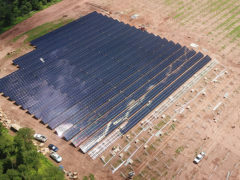 Two different utility companies contracted with GEM Energy to construct five ground-mount solar arrays in three states. A sixth ground array is underway in Ohio and due for completion in 2018. The five completed arrays were built with advanced technology thin film photovoltaic modules. All were operational by in late 2016 or early 2017, and are connected to the grid’s existing distribution system. 3.2 MW ground array on 19 acres in Indiana. Located in an industrial park, the project is an example of how utility-scale solar can be integrated into an urban commercial setting. A second 6.4 MW ground array on 40 acres in Indiana. A 6.0 MW ground array on 35 acres at a Michigan site. Ground arrays – sized at 1MW and 364 kW – in two different Ohio cities. GEM Energy was chosen due to its ability to complete the projects on a tight schedule and utilize skilled trade workers from Ohio.